Written by Matty Cohen on May 9, 2013 Blog, Product news. Today, we’re excited to share a design with you all which captured our attention from the first moment we laid eyes on it. Clean, crisp and generous with open space are 3 characteristics that come to mind when introducing this bright new entry into our catalog. 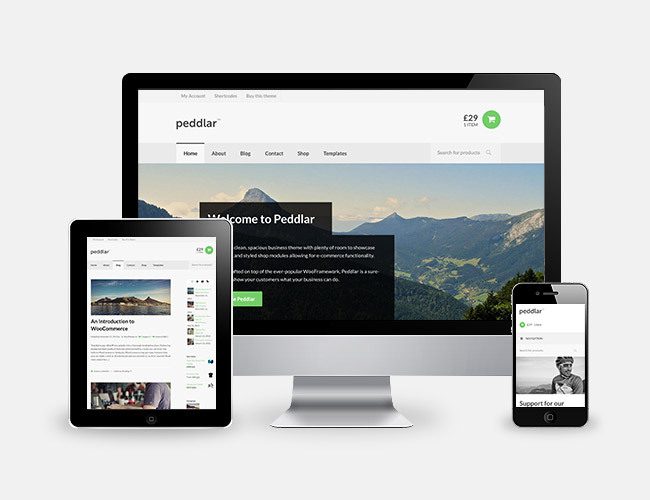 Ladies and gentlemen… peddling onto stage today is Peddlar, our latest WordPress theme. When setting up any website, the objective should always be to showcase the content in the best way possible. With its generous amount of open space, Peddlar aims to do exactly this. As Peddlar is primarily intended as a storefront theme, the homepage includes an area for showcasing the latest products in your catalog, as well as support for the WooCommerce Brands extension for showcasing the brands your company works with. Designed by Gary Murray, Peddlar can be shaped and crafted as desired with a few small tweaks in a child theme, or using the in-built theme styling options. 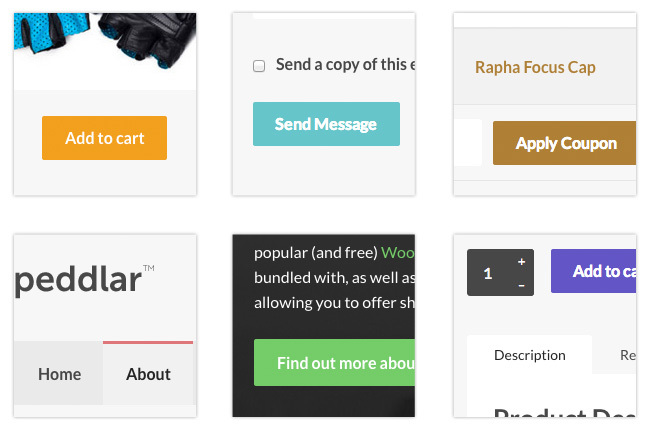 With the store functionality powered by WooCommerce, the entire WooCommerce extensions library is also at your disposal to take your online store to the next level. Peddlar includes a full-width featured slider area, for showcasing just about any information you wish to offer your visitors. Powered by its own custom post type, you could place a call to action, a video or just really attractive photographs in this wide showcase area of your homepage. While Peddlar is primarily a store front-focussed theme, the design can be used for anything from a standard business-style layout to your own personal branded nameplate website. With styling support for our Features and Testimonials plugins, as well as a “Blog” and a “Business” page template, your own design is just a few small tweaks away in the “Theme Options” section. Customising your copy of “Peddlar” to meet your desires is important to us. With this in mind, no expense has been spared to ensure ease of use and customisation of the theme with a few clicks and your custom eye-catching imagery. Alternate colour styles have also been included, to quickly provide a unique feel on your website. These alternate styles showcase it’s flexibility with each CSS file being only a few lines of extra styling. Grab this theme with a 13% discount coupon, valid until 16th May, 2013. Just use PEDDLAR13 as your coupon code on checkout. Looks pretty good! Really dig the openness and it is a great way to showcase your products. I might go for this one 🙂 as an upgrade from wootique. Other than that, it’s an awesome clean looking theme. A portfolio plugin is being worked on. No ETA as yet. So is the spec set in stone? I have yet to see a WordPress-based portfolio system that meets the requirements of my clients, but some themes over in a forested area come extremely close. In fact, one of my clients bought a theme over there and dumped my Canvas-based design, largely because of the limitations of its portfolio system. So, I have some input if you’re interested. I think a portfolio plugin is a must for all new themes. Progress or ETA on the portfolio plug-in? Very nice! What plugin/feature showcases the Brands below the testimonials on the homepage of the demo? I subscribed for Themes Club but I can’t access my account or reset my password. I can’t found a phone for contact and none of my contacts was answered. I’m effectively losing money due to lack of support. Sorry about the off-topic comment, I’m trying every contact possible. Didn’t find this or the info@ e-mail. Since my comments aren’t comments and are off-topic, please delete them. Thanks. Looks very similiar to the other ones.. I am not impressed. Yet to see a WC theme that will blow my mind. In your opinion, which does it look similar to? I am agree with you. Since months ago WooThemes doesn’t have anything new and fresh, all themes seems child themes of canvas. A very nice and versatile theme, indeed. Great job. While reviewing the theme, I noticed that the Testimonials appear right below the slider and not just above the footer – unless you add the Testimonials widget to the Footer Full Width widget area. Yes. That’s how it is set up on the demo site. Also in Homepage Setup panel, disable Recent Products, Testimonials and Features. Add these in “Homepage” sidebar. Sorry to hijack the thread (like another user) – but I have also been experiencing issues getting into my account. The lost password doesn’t work now for at least 3 days. I have sent 3 or so separate customer support tickets and heard nothing. And now, today – your lost password functionality does not work. How do I get into my account that I have paid for? As we suggested above, please contact our support team either through the Support Portal or by emailing directly to us via help[at]woocommerce.com. Thank you for getting back in touch Coen. I have tried both options and heard nothing back. I am really at a loss right now as to what to do to access my account. Hi Coen, still waiting to hear back from somebody on staff. Is there any possibility you could email somebody on your team about this. I have been waiting nearly a week now and still have no access. “WooDojo – Social Widgets” to be specific. The brands plugin shown in the list of extensions doesn’t look like it does the same as shown in this theme. Can you confirm that it is the same plugin? Looks really neat on here. Yup, same plugin. Post in support if you’re having problems. Any chance you’ll release a new FREE theme anytime soon? Crossing my fingers! top stuff my friend 😉 glad to hear it. I can see this sensei plugin really growing in the coming years. Why you guys do not integrate it into the themes? No Pinterest button? All sites need to integrate with the world’s fastest growing website out of the box if you want serious traffic. The theme looks great but it’s a bit annoying on the homepage when the resizing slider makes everything else slide up and down. I really like this new theme! Great, simple design. One thing I’m looking for in the ‘front page widgets’ is a widget that let’s my front page act like the store page. I’d love my store page to have the nice slider at the top and I think it would be easy. Why not a nice ‘front page widget’ that let’s you control the products displayed a little more than the typical ‘recent products’? Why not a more robust widget that has ‘recent products’ as an option? But also has category as an option? Or number of products displayed as an option? Very nice theme.. Flat, light and clean.. Quite trendy I guess..
Do you know if DAP will work with this theme? I’m interested in using the theme for online courses with Drip content structure. My favorite WooTheme to date. More like this one please! Nice theme, please provide more of these theme which give woocommerce a great boost! Very nice looking! Many thanks for the amazing template.Great theme!